Kitkatscanread: Teeth by Chele Cook Blog Tour!! 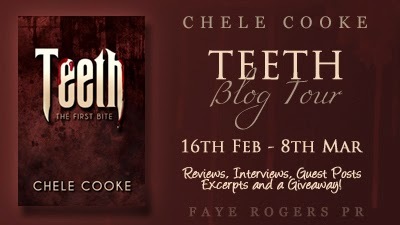 Teeth by Chele Cook Blog Tour!! 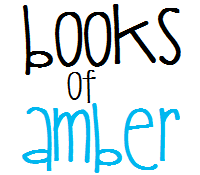 Howdy, folks and welcome to another awesome blog tour! Personally, I love books with vampires in, and this one won't leave until it's had a bite. So I'm kicking off the tour with some exciting stuff happening. Stay tuned for a guest post from the author, and you can win some goodies in the giveaway mentioned. But first, let's talk about the book shall we? 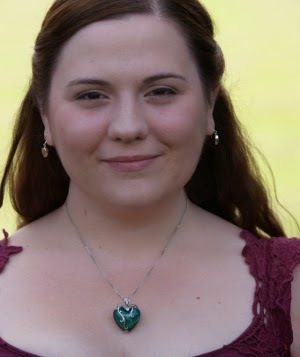 Chele first started writing as a teenager writing fanfiction and roleplaying. Before long playing in other people's worlds wasn't enough and she started creating her own. living in San Francisco at the time, she found a lot of inspiration in her favourite city, some of which can be found in her books. Out of Orbit, and the first book of a vampire serial, Teeth. A few days ago I had a crisis. After being asked to rate my top vampire stories, I realised… holy malony, I don't think I have any. a medium that, when done well, can have just as much story telling as a book. romance. Not that I'm not a fan of romance books. I've read some wonderful vampire romance, but they don't inspire me the way action books do. I like my romance to be a side plot, not the main event. me, even if they happen to be in a different medium. So, here they are. Buffy to our screens that I really got into the idea of the undead. outside of killing, and even when they are being their most evil, we love them. forgiven Fox for cancelling Firefly. character, Claudia. I really connected with her and the horror at being young forever. when it came to writing Teeth. If turned as a child, you obviously stay looking young, but mentally young? Will a vampire turned at ten still be throwing temper tantrums when they're one hundred and fifty? Luckily, I don't have a ten year old vampire in my stories yet, but when I do… oh you'll know it. Come on, who doesn't like it when a vampire is staked and they explode in a torrent of blood? some great vampires that were the epitome of moral ambiguity. They killed, they had fun, but they were also sometimes pretty decent people. Yes, there was a lot of romance in the show, but that always ran alongside the bigger, more exciting plots. as an interesting group of characters to explore. me want to change almost everything. won't even get started on how creepy their relationship is. survive. It was all so perfect that it made me wonder why the hell vampires weren't populating the earth. vampires of the south, a tale that was brushed over in all of two pages. and tell them the way I wanted to. Yes, I would have romance, but it would be a side line to other plots. There would be special abilities like speed and strength, but they would come with serious downsides. I would go back to the tradition of vampires not being allowed in the sun. damned already) they would be happy about it. 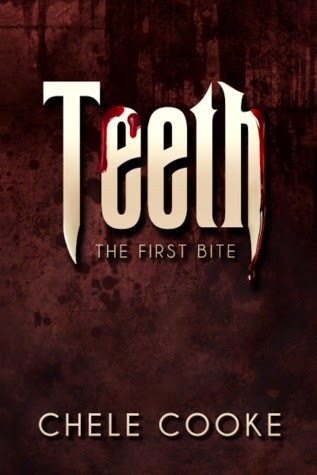 stories inspired me to create in 'Teeth'. If you are having trouble with seeing the rafflecopter, please click here to be directed to the page. Don't forget to follow the tour and check all the other stops out!! And now this stop has come to an end for me. A massive thank you to Faye for asking me to participate. Thank you so much for having me, Katie. Writing this post for you was so much fun, and probably could have been about three times longer for how much I wanted to gush about Spike and Angelus.